This is such a powerful quote that made me think of all the things I am responsible for. I love my work and feel a deep sense of responsibility to be a great coach. I invest a lot of time, money and energy to improve myself every day. However I feel that being responsible is also about speaking my truth, standing in my truth and stepping into my power. In the past, I was a people pleaser so I would compromise myself for the sake of others. That wasn’t being responsible to myself. The first person I must be accountable to is me. To stand in my own power and truly be my best, I must understand my values take responsibility for them. This is being and giving your best. I coach many people who are learning this as well. Learning to say NO and speaking their truth and living their best life is the responsible way. How about you? Are you ready to stand in your power? If you need help let’s talk. Here is my Tedx talk to watch too. In the confrontation between the rock and the stream, the stream always wins, not through strength, but through persistence. Are you afraid of confrontation? Many people are. I was, until I became aware of the damage I caused myself and others. You see, confrontation is healthy and necessary for your own spiritual progress. It is not always easy to confront someone without it turning into a battle of egos. That’s not what confrontation is all about. It is about speaking your truth and allowing others to hear it. If you feel like someone is taking advantage of you, speak up! You see, we teach others how to treat us. 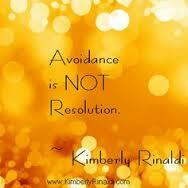 We need to express our feelings in a healthy way, and there is no other way Avoidance is not resolution! I feel so much better and healthier, now that I confront a situation that does not resonate with my highest good. What you resist will persist, so confront the situation with confidence, truth and persistence.